Archives of previous years’ reports can be found here. What a very interesting launch. Seems like we had a lot of unsuccessful flights. By the afternoon, the Rip Rap Road field was very muddy with all the snow melting. But we did get in 44 total flights. There was a total of 10 flyers and we had 2 brand new flyers for the first time. Welcome Paul and Bernie to the exciting sport of model rocketry. Our first rack of rockets, I was first off the pad with my “Finny” custom built rocket on a B6-4. Jay tried to get his rocket in the air, but had a igniter problem. Here are some of the other rockets for the day. Justin launched 1 rocket and then he left. I think he left because he did not want to get his new BMW hit with a rocket. Our new flyers, Paul and Bernie, both flew 2 flights. Bernie flew his Trajector with a 2 stage booster with F15 Estes black powder motors. The chute deployed and drifted into the neighborhood to the west. Jay and Bernie made the trip to recover the rocket and bring it back. Zach launched 2 rockets. The first flight, the chute did not deploy and we will say it “Yard Darted”. Second flight with his PAC 3 with a G74 screamed off the pad but still landed in the field to the south of us. Tom S was 2 out of 3. His glider with a B4-2 did a perfect Loop “D” Loop and landed on the other side of the field. The rocket with the D21-7 ripped off the pad and safely recovered. His third flight was a fantastic “CATO” sending parts of the rocket all over the pad area. Carter launched 6 rockets. Jay also launched 6 rockets. His radio controlled glider launched twice but only got in the “AIR” once. Jay also launched a 2 engine cluster of MicroMax engines and several other rockets with MicroMax engines. Lee did manage to get 7 rockets in the sky and Bill E also launched 7 rockets. But Mike R had the most flights for the day. He had a total of 8 flights. He will have to make repairs to his fleet just like a lot of other rocketeers. Be sure everybody brings your broken rockets to Tuesday build night. Randy has all the parts you will need in STOCK. The weather was cold, windy and overcast. We still managed to get some rockets in the air. We had a total of 42 flights. I even heard that some of the rocketeers had never laughed so hard at a launch. More about laughs later. Most flights landed far away, almost to the southern tree line. Had a couple of flights that landed in the next field to the south of us. After setting up, I put the first flight in the air. “Finny” on a B6-4. With the wind, we were using smaller chutes, and when “Finny” landed, he broke a fin. I also launched “Orange Transport”. Still using a smaller chute, it landed and broke a fin. My third flight of the day was “LIL Weasel” on a B6-4. Did not fly very high and chute deployed almost on the ground. Jay launched 3 rockets. Sprint XL on a D12-5, Goblin on a E30-7 and a two stage rocket, D12-0 to a B6-4. Jay said he was glad he did not use a C6-7 in the top stage. Todd S launched his “Purple Sparkle 4” on a H135W to 1590 feet. Steve B from Frankfort, launched his Heavy Bullpup on a C11-3. Tom S put his Orange Crush up on a C11-5. Ron S got in some long walks. His rockets seemed to drift very far south and into the next field. Ron gets the “10,000 Step Award”. He flew his Sprint XL on a D12-5, Goblin Upscale and Hawk on E30-4’s. But his best flight was his Viper on 3 Estes F15-6. Carter d, if you want to say, got in 6 flights. I had an old pack of C6-5’s that I thought would CATO. Sure enough, the first one CATOed in his Dare to be Square. Very little damage so he loaded another old C6-5 in the rocket again. Again the motor CATOed. Very little damage again so for the third time, he loaded the last old C6-5 in the rocket. They say “Third Times a Charm”. Carter put the rocket on the pad and this time, the CATO damaged the rocket, the motor split from aft to forward along the motor tube. Carter did say that he had the technology to rebuild. His “Sheesh Kabob” came off the pad and did some “loop de loop”. The upscale version, Swoosh Kabob had a great flight on a D12-5. But his best flight was his Weasel on a G40-10. Even though Carter is a high power certified flyer, this was his first “G” motor that he has flown. Michael R had to out do Carter with his Dare to be Scared. He flew his on a E15-4. The motor “Chuffed” so hard that it almost came off the rod. Michael managed to get in 5 flights. He said “I have plenty of rockets loaded, but having to walk way to far to recover them”. His “RX-7” 2 stage rocket blazed in the sky with a B6-0 to and 1/2A6. Dave C went all out with his 5 flights. Augie with a single E16-6, Batrok on a A6-4, Teros with a B6-4. After those flights, it went down hill. Or should I say “Down the River”. His “RocketTail” rocket had a huge plastic egg filled with candy for the kids. The Aerotech F67-4 lifted the one pound of candy off the pad. Hopefully we will see Ron’s video. The rocket did not deploy the parachute and it splashed down in the creek sending on the candy floating down the river. Some of the rocketeers started cleaning up the wreckage and candy from the creek. Someone had big rubber boots picking up the candy. We will say he slipped and the water was deep and over the top of his boots. Everyone should always bring extra shoes and socks to a launch because you will never know what may happen. Then Dave launched his TEROS on a H123W. The up part was good but when the chute was deployed, the nose cone got tangled in the chute. The rocket came in a little too fast and broke two fins. We finally at one point of the day, had a clearing in the sky. I told Paul that it was time for his Level 2 flight. He had his extended 4″ LOC 4-Banana with Perfectflight SL100 altimeter. Up it went, over 3900 feet and landed just south east of the launch pad. Paul brought the rocket back and after the final examination, he passed his L2 flight. Congratulations to Paul. Last but not least, you have Bill E. He launched and launched and launched. Ended up with a total of 12 flights. He gets the “Most flights for the Day Award”. Three of his flights we all can remember. The LCO announced his rocket by mistake and called it “R2 DoDo”. R2’s chute did not deploy and splatted on the ground. SO SAD! His Long John Silver on a A3-4T yard darted and will have to be renamed because it will be a little shorter. Then he flew another rocket that he said was an A8-3 but only went up maybe 50 feet. After looking at the motor, he only had a 1/2A in the rocket. I will change the flight card. After the launch we headed to the Purple Monkey for pizza. Due to planting on the Federal Road field, we moved our launch to our low power Lowry Road field. Winds were light and variable. (At Times) There was a total of 13 members and the Robinson family that was there for the first time. The Robinson’s flew 2 rockets for the first time. We flew 2 clusters and 3 two stage rockets. Mike R flew a bracket (brace) of all the motors from 1/8A to F. Believe it or not, we had a total of 96 flights and used 100 motors. I started the day out with flying the first rocket of the day. I managed to get 5 flights in the air. Jay launched 9 rockets. Jay was trying out a new design for rockets and soon will be at eRockets. (TOP SECRET). Jared put in 11 flights. The “Birdie” rocket really ripped off the pad on an A10-3T. Can’t believe this either, Randy B flew 7 times. He flew his SATELLITE KILLER 3 times. After the third time, we will say the SATELLITE won the battle. Gary B got there in the afternoon and put in 2 flights. Tom S flew 3 flights including his NCR LaserHawk on a G125T for a very nice flight. Mark M brought out his 3D printed rockets and flew 6 total flights. Steve B from Frankfort, quickly put up 5 flights. His rocket named “Crazy Frog”, flew twice. Once on a G75 Metalstorm and a G76. Also got his “Gizmo” up on a G67R. Justin B was back from vacation and got in 8 flights. His most spectacular flight was his Circus Act on a G80-7. The rocket landed in the neighbors back yard. That is all I am going to say about that!. Phil Q flew 3 flights. The Argent V2.0 flew twice with G64-7W and the Chute Release. Dave C scrambled to put up 5 rockets. NO CANDY THIS TIME???? Michael R put in 14 flights. Launched every motor from Micromax to the big F motor. His rocket named “The Lillian S” flew on a F26-6FJ. Carter d kept flying all day long. He put in 16 flights. He flew his “Square Banana” and the nose cone came off losing his altimeter. He went out to pick up the rocket and started looking for the altimeter. He finally started to hear the beeping, went right over to it and picked it up. He also flew his “Kabob Family” rockets. He introduced his new member of the family, “Square Kabob”. He also flew a Dare to be Scared on an E15. And that is all I am going to say about that!!!! We were all done by 6:00pm and packed up to go home. Thanks to everyone that helped with our launch. 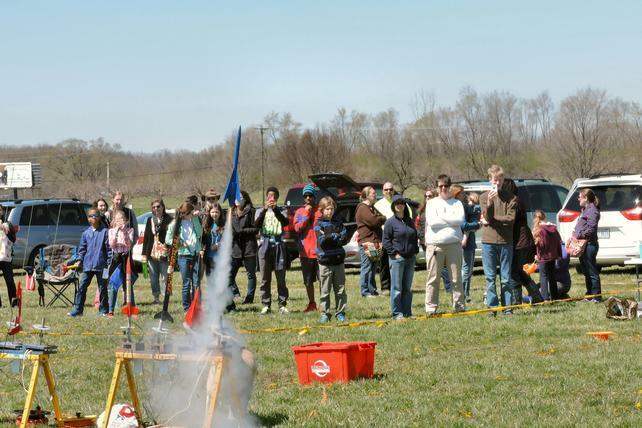 We all were looking forward to a great day of rocketry. Weather report looked pretty good. Little did we know that weather can change in a minute or should I say by the afternoon. By 3:30pm, we looked off to the west and see nothing but black thunderstorm clouds coming toward us. So we had to put all the equipment in the truck and call it a day. But the highlight of the afternoon was a visit from the ICE CREAM TRUCK. On a hot day, the ice cream went down petty good. Even with the bad weather coming in, we still got 74 flights in. I started the day off with my creation of “Finny” on a B6-4. At Naram last year, I received an Estes “Red Nova”. I finally decided to get it in the air. I used an adapter and flew the rocket on a C6-3. I launched a total of 8 rockets for the day. Justin B had a lot of fun with the new 24/60 reload motors. He flew the F51, F62 and the F63. These new 24/60 motors really rock. Justin had a total of 4 flights. Randy B got there a little late but he got 4 flights in the air. Dave C managed to get 7 flights. He even tried to have a Bull Pup drag race with me. His rocket took off and mine just stayed on the pad. So Dave won!!! Carter D brought out his “Kabob Family”. His flights for the day were 8. Bill E brought out a lot of Clones. His “Mach 10” was designed to glide. We will just say that we did not see any GLIDE. Let’s give Bill the trophy for the most flights. He had a total of 10. Joe H had a pretty good day. His best flights were Ventris on the new F67, his Tomahawk on the F67 and the F-9 Falcon on an E9-6. Mark V put in 3 flights and Mark M put in 4 flights with his 3D printed rocket. Mike R flew his really nice Nike Apache. He also flew 2 rockets with clusters. His Optima with 2 E9-6’s and the Astron Cobra on 3 B6-6 for two really nice flights. Tom S launched his “Scrambler” with an egg aboard, twice. The second launch with the 36″ chute had a very long duration time. Jared launched 5 flight. Aadi brought his Super Big Bertha out to fly. He flew it twice with Aerotech E15’s. Claire and Dominic each launched one rocket. Total motors used at this launch was 77. Believe it or not, we did not launch a G motor. Thanks to everyone that helped at the launch. 295 total flights including 7 club members flights. 241 were first time flyers; 47 were not. I would like to thank everyone that helped with the build, display table and launch area. Let’s say that the weather was very interesting. Forecasting rain in afternoon but the sun came out and was a very nice day. The sun dried out our equipment from our Saturday launch. We did have some strong winds. Had a total of 52 flights. Also had 12 first time flyers. Total of 18 flights from first time and guest flyers. I put in a total of 13 flights. Tom S flew 2 rockets. Jay managed to get 2 rockets in the air. Randy B only got 2 flights of his own. He did help a lot of the first time and guest flyers with their rockets. Our new adopted club member, Ethan Wright, launched his rocket 7 times. Larry Rice from CSAR, flew 7 rockets. The rain held out until 3:00pm. We did get in a total of 69 flights. There were 12 flyers and the Young family attended the launch. Below are the flyers with highlights of their flights. Michael R.- 4 flights- Nike Smoke2 with a C6 needed some nose weight? Very interesting weather. Weather report said one thing and was something else. We had nice sunny skies and just a little bit of breeze. Wind was coming from NorthWest. We did have some long walks but had plenty of room for the rockets to land. There was a total of 29 flights and 35 motors used. We had 13 flyers and we even had some spectators at the field.University of Cincinnati rocket team came to the field to launch some rockets and for certification flights. Nate M launched a 2 stager with an Estes F15 to an Estes E16 for a nice flight. He also launched a V2 on a D12-5. Andy T passed his Level 2 written test and then passed his L2 flight on a J270. Congratulations Andy. Then Patrick B had a successful Level 1 flight on a H219. Congratulations to Andy. Thanks for attending our launch.